When thinking about a holiday, many people plan their trip on their own, using websites, recommendations and travel books to choose their next site. Others turn to an escorted tour company and join their tours. 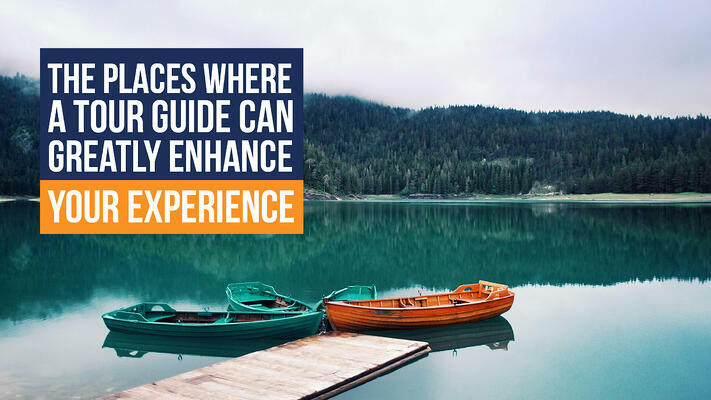 The reasons why many people would rather choose travel agencies and tour guides is to have an expert recommend where to go, what travel route to do and more. Oftentimes, the destinations have so many options that the information online or in travel books can be overwhelming. Another strong benefit is the fact that these tours are planned and executed flawlessly, with practically no effort from the tourist’s side. In countries like Israel that are rich in history, a tour guide will enhance the learning experience to another level. And in countries like Cuba that are off the beaten path, a tour guide will help give a window into the local dynamic in a way that travelling alone can't. If you’re planning to visit some countries, such as Russia, Portugal, Israel, Morocco or Cuba, having a tour guide will enhance your experience and you can be sure the trip will be of the highest quality. This Middle Eastern country is one of the favorite spots for tourists due to its diversity. From beautiful beaches and natural resorts, modern cities and those preserving the remains of history to archeological sites and holy places - this country leaves its tourists stunned. What is a must see in Israel (in addition to Jerusalem and Tel-Aviv of course) are The Hills of Judea, The Old City of Safed, Golan Heights and The Sea of Galilee. The Hills of Judea – this remarkably beautiful area is famous for its Christian sites: a Chechen Abu Gosh village with its two ancient monasteries, Latrun Trappist monastery of the silent monks, the Monastery of the Holy Mary Queen of Palestine at Deir Rafat, and Ein Kerem which is the birthplace of John the Baptist. The Old City of Safed- this mystical city is the highest city in the Holy land. It is a blend of the past and present. Its unique streets and houses and the view of the Sea of Galilee and Tiberias will make you wish to stay longer. Golan Heights and Sea of Galilee give some of the most spectacular views you’ll see during your stay. The largest country in the world offers everything to its tourists, from historic sites and artistic riches to stunning countryside and rich nightlife. Some of the places that tourists rarely have a chance to see without a tourist guide include Novgorod, Valaam and Kizhi islands and The Golden Rings. Novgorod- known as the birthplace of Russia where Prince Rurik proclaimed the modern Russia state in 862. The area is famous for its gorgeous Cathedral of St Sophia, the oldest Russian church; Dostoevsky’s hometown Staraya Russa and the Volkhov River. Valaam and Kizhi islands- for those who love boat tours, this is the right place. One can visit a natural park, open air museum and learn more about these holy and unique places and their churches. The Golden Rings –a route famous for its network of ancient towns that include Suzdal, Yaroslavl, Vladimir, and Rostov and their unique architecture, fascinating temples, and monasteries. This country is a gateway to Africa. Its ancient cities, deserts and mountain ranges, in combination with local people’s hospitality, make a trip there a truly amazing experience. Marrakech- this city offers museums, a labyrinth of narrow streets, Djemaa El Fna Square, and markets and stores that sell everything, from spices to clothes and leather. Atlas Mountains- this is a rugged area with spectacular beauty, a view of villages and lush fields. This is the favorite spot for those looking for outdoor activities, such as hiking and mountain biking. Fez- this ancient town with its rich history and culture attracts more and more tourists each year. This is the world’s largest car-free area, famous for its alleys, squares, fountains, and aromatic food stands. For those who are in search of cobblestone villages, medieval castles, stunning beaches and enchanting cities, Portugal is one of the top choices. Lisbon- the city of cathedrals, ancient ruins and cobbled alleyways. Do not miss São Jorge, an ancient castle; Mosteiro dos Jerónimos, the 15th-century Manueline monastery; Gulbenkian museum and Sintra, a place of palaces. Evora – this city, located in the center of Portugal, offers some fascinating historical sites that include a majestic cathedral, a Roman Temple, and prehistoric standing stones. Algarve- a southern region of Portugal famous for its beautiful and pristine beaches, breathtaking cliffs, waterparks for teenagers, and rich nightlife. Its historic sites include Old town Faro, Alvor castle, Fort of Sao Sebastiao, The Torre da Medronheira (a tower) and many more. Those who are looking for magic and a magnificent tourist destination, Cuba is the number one choice. Its historical heritage and attractive beaches made this country one of the most popular tourist sites. Explore its crocodile-infested swamps, forests, rugged mountains and coffee plantations. Havana is one of the most unique cities in the world. It is divided into three areas: Old Havana, Centro Havana and Vedado. The city is famous for its dilapidated buildings, street stalls, old classic cars and museums. Vinales is a city of colonial-era wooden houses, Municipal Museum, Casa de Caridad Botanical Gardens, the Viñales Valley and the Sierra de los Organos mountains.